Raw papaya was one of my childhood favorite and in variably many other vegetables too.I used to love the raw crunchy ones and have sliced ones just like that.And mummy used to peel and cut raw papaya for thoran(stir fry) and I used to grab these thin slices and have it from that.But after coming here,I had not seen the raw papaya until recently I hooked one at the stores.The perfect combo with this is the red chori peas/red cow peas (vanpayar),but I didn't have that and so used black eyed peas.This makes a very filling stir fry with rice.Hope u'll make & enjoy with rice!! -Wash and cook the beans with salt and turmeric powder.As I used frozen packet,so didn't pressure cook them.If you are using red chori peas(vanpayar),please do pressure cook. -Peel and cut the papaya in two halves.Deseed and wash it again.Chop it fine as like we do carrots or cabbage for stir fry.Keep aside. -Heat oil in a pan,splutter mustard seeds.Saute onion ,add in the chopped ginger and green chillies. -Then add the chopped papaya and grated coconut.Add in the spices.Toss it well,add salt. -Cover and cook for 5-7 minutes. -Add in the cooked beans,along with water &cook again for another 10 minutes.Adjust salt. -Uncover the lid and dry up the water content in it on medium -high heat. 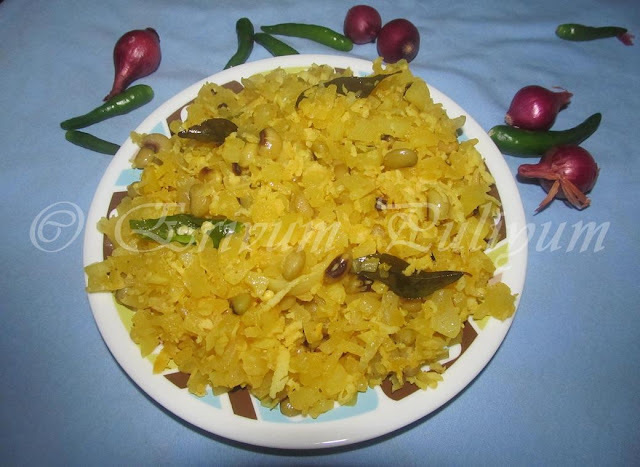 -Serve it hot as a side dish for rice!! * I have used the frozen packet of black eyed beans.Actually red chori or vanpayar is used. * For added taste,mom usually tempers it with a tsp of boiled rice too.It splutters and gives a unique taste.I haven't done that. * If you wish a more spicier version,do add half a tsp of chilly powder too. 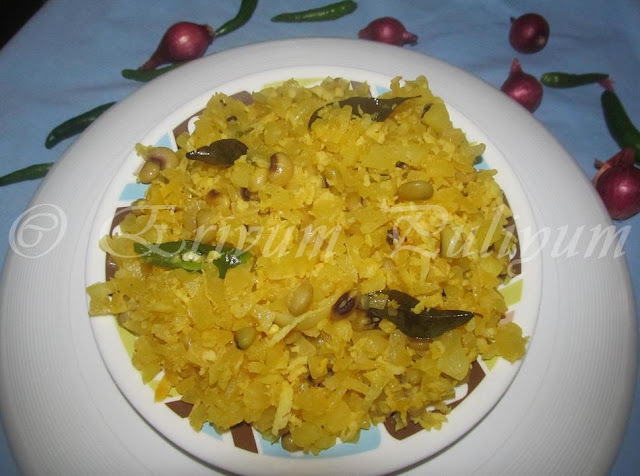 Simple and delicious thoran. Love the addition of the black eyed peas. Thoran looks rich in colour and YYYummYYY!!! Heard this is a very nutritious food, specially for nursing moms. I was on a look out for this recipe. Thanks for sharing Julie, easy to make. Thoran adipoli papapaya with vanpayaru adipoli. Sounds really delicious...Love to taste it. This is totally a unique recipe for me. I have only eaten ripe papaya and I love it. Will look for raw papaya and try this one. innovative & healthy recipe... looks yumm..
Nice thoran, I too tried this raw papaya and liked it. Yours looks delicious. Never tried this combination.. looks delicious! Awesome Julie..Made me nostalgic and long for raw papaya..yummy. looks very tasty and yummy..
Yummy dish. We love raw papaya. Very different dish, healthy too..
i have not heard about this thoran.. looks healthy and tasty..